Foch Family Real Estate | York Region's high housing prices: Are there solutions or is this the new reality? York Region's high housing prices: Are there solutions or is this the new reality? Twenty-four-year-old Nick DeRyck is living in his parents’ Newmarket basement, wondering if he will ever be able to afford to buy his own home despite finishing college, being employed and saving thousands of dollars towards a downpayment. Meredith Blunt’s family is readying to leave York Region after being outbid several times on Aurora homes despite a budget of $700,000 and an annual household income of more than $100,000. The average price of a house in the GTA is now $950,00 and requires an annual household income of $165,000. In some communities it’s even higher. In Richmond Hill, the average price is $1.07 million and you need a yearly household income of $179,550 to get in the front door. Welcome to the new reality, said York University professor James McKellar. While soaring prices make daily headlines, measures to help reduce costs could prove too unpopular to be implemented, McKellar, director of the real estate and infrastructure program at the university’s Schulich School of Business, said. Prices are sky high because there are so many people able to buy, whether they are investors or people who have borrowed money from parents and grandparents. “People tend to talk about housing affordability whereas the problem might be that housing is too affordable. The minute those people withdraw from the market, the prices may go down,” he said. Governments can force people out of the housing market through measures such as mortgage restrictions and tax policies. “If you go to the federal government and say you should essentially have policies to drive people out of the market, they are going to say ‘Are you crazy, we want to get re-elected.’ All governments don’t want to face the problem. I know it’s perverse but it’s like anything else where people will price the market. The government isn’t setting the high price, the buyers are and until you force some of them out of the market, the prices aren’t going to come down,” McKellar said. Meanwhile, we all have to alter our perceptions of the type of housing we believe we are entitled to, said McKellar. In 1950, the average house was 830 square feet and was home to 4.2 people. Today, the average home is 2,000 square feet and is home to only 1.7 people, he said. Meanwhile, people in Canadian urban centres may have to get used to the notion that they will have to rent for life, as many Europeans do, rather than hang on to steadfast beliefs that they will own their own home, McKellar said. 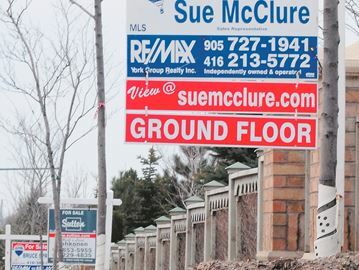 Housing prices in York Region are an escalating concern, said Newmarket Regional Councillor John Taylor, who chairs the region’s community and health services committee. “Housing affordability is one of the most significant issues and challenges facing York Region and the residents of York Region today. It’s obviously an issue beyond the borders of York Region. I think it has always been an important issue but the recent hyper-escalation in housing prices has really brought it to the forefront in a new way,” said Taylor, a member of Housing York and co-chair of the Human Services Planning Board. Higher levels of governments are making moves to address the issue, including the federal government’s announcements Monday that it will move to tighten mortgage rules and closing a tax loophole for foreign investors, he said. Meanwhile, Taylor wants to explore ideas raised at a regional workshop last week by British housing official Geraldine Howley and Australian housing official Scott Langford. For example, “profit for purpose” would allow the region to investigate ways of increasing its subsidized housing profits – such as boosting the number of market value units in its buildings – with the higher income used to increase the number of subsidized housing stock. “I think (high housing prices) is a new reality but I don’t think we just have to live with it. Steps can be taken by all levels of government and the private sector that this new reality is creating,” he said.